I try to capture the beauty of my travels and where I live through watercolor, oil paints and drawings. 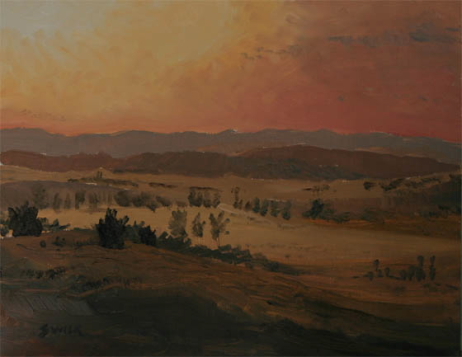 Here you will find examples of his artwork that is either based on his photography or painted en plein air. Feel free to browse the site and please send me any questions or comments. I recently moved to Austin, Texas and am working on capturing some of the Hill Country. Please check back as I will be updating everything on the website! I am working on a pictorial travel log of my travels through France. As I finish pictures from each place my wife and I went, I will add them to the site. I hope you enjoy as you see and read about our travels to Paris, Burgundy and Chamonix. Please click here to see more of my drawings of France series. NEW: Join The Mailing List - Stay Updated! Please join my mailing list when you get chance. Just fill out the contact form and write that you would like to join the mailing list. I won't email you very much, just to let you know when I list a new painting on Ebay or add new pictures to the website. Thanks very much and I definitely won't share your info with anyone! This is an oil painting based on the sunset in Tuscany, Italy during the summer. It is warm and the weather is perfect to find a nice glass of wine and Italian food in one of the many small towns in the region. The picture was painted based on one of my photos that I took while traveling through Italy. It is 11" x 14" and has many hints of Burnt Sienna and Yellow Ochre. 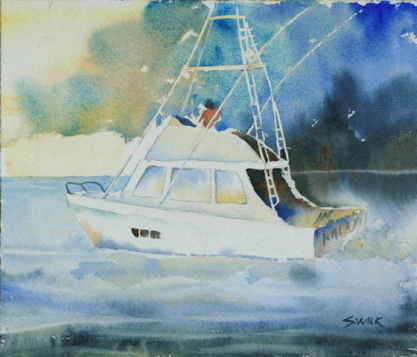 This is a watercolor painting based on an early morning boat ride near Islamorada in the Florida Keys. The sun was just coming over the horizon and lit up another boat travelling next to us. The air had a nice early morning feel of summer to it and it was perfect to be out on the water. This picture was also based on a photo. It is about 5" x 7" and was originally painted as a study for a future larger picture. The painting has tones of Ultramarine Blue, Prussian Blue and Cerulean Blue. Sometimes I list small format paintings on Ebay. This link is my Ebay store.